This is a book store the way book stores we're meant to be. Their motto is "Fiercely Independent Since 2003". The store is owned by the dynamic duo of Jason Smith and Rachel Weaver. 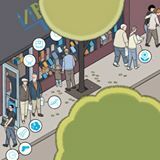 These people are relevant, they even have a Chris Ware illustration depicting their store. ​"You learn really quickly when you own a retail store that you can't be everything to every person, but we like to think that we try especially hard, and that we're more successful at more things than your average store. We have the most exciting new releases at discount prices. We have quality used books. We have great publisher's overstock, and we do just about every other legal thing you can imagine to stock great titles at even better prices. After working in seven different bookstores between the two of us over the years, we learned a lot of secrets on how to get the best books and sell them at the best prices, so we do just that. Also, if we don't have a book in stock, we'll happily special order it--and even most special orders will be offered to you at a 20% discount, and it generally only takes a few days. "